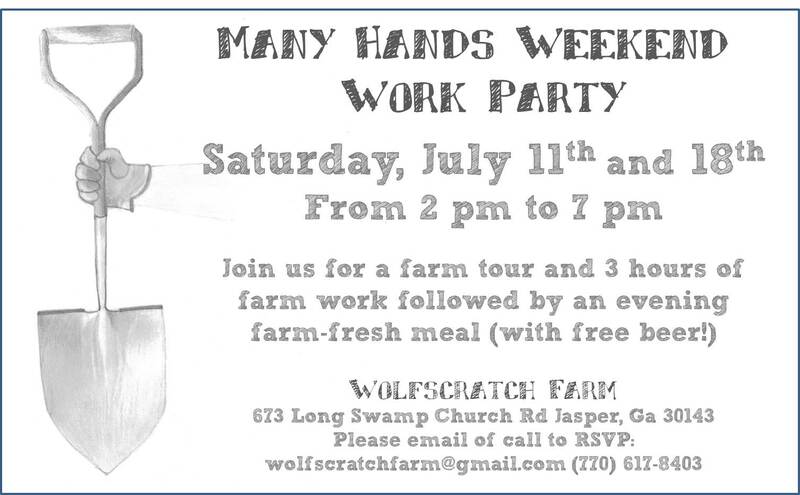 Come Join Us for a Many Hands Work Day in July! We’ve got our work cut out for us this summer, and would love to have a bit of help and a bit of fun with our awesome community of supporters and friends. Anyone is welcome to join us at 2:00 PM Saturday, July 11th and 18th for a few hours of diggin’ in the dirt, followed by feasting and festivities among friends. We work hard here at Wolfscratch Farm, but we always strive to make it fun, too! If you’re interested in joining us, please RSVP by sending an us an email or signing up for a weekend (or 2) on Facebook! ← Think you want to be a farmer?